Finland shocked the world when its 15-year-olds scored highest on the first Programme for International Student Assessment (PISA), a set of tests touted for evaluating critical-thinking skills in math, science, and reading. That was in 2001; but even today, this tiny Nordic nation continues to amaze. How does Finnish education - with short school days, light homework loads, and little standardized testing - produce students who match the PISA scores of high-powered, stressed-out kids in Asia? Each year, teachers, administrators, and parents face a barrage of new education software, games, workbooks, and professional development programs purporting to be "based on the latest research." While some of these products are rooted in solid science, the research behind many others is grossly exaggerated. This new book, written by a top thought leader, helps everyday teachers, administrators, and family members separate the wheat from the chaff and determine which new educational approaches are scientifically supported and worth adopting. From an early age, it is drilled into our heads: Restlessness, distraction, and ignorance are the enemies of success. We’re told that learning is all self-discipline, that we must confine ourselves to designated study areas, turn off the music, and maintain a strict ritual if we want to ace that test, memorize that presentation, or nail that piano recital. But what if almost everything we were told about learning is wrong? Mostly how we "remember", not how we "learn"
The bestselling book ever on classroom management and teaching for student achievement with over 3.7 million copies sold. 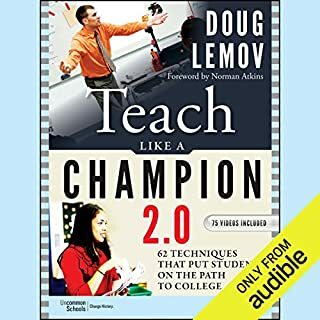 The audiobook walks a teacher, either novice or veteran, through structuring and organizing a classroom for success that can be applied at any time of the year at any grade level, pre-K through college. What do daffodils, baseball announcing, and Tina Fey have to do with teaching? As it turns out, a lot. In The Happy Teacher Habits, Michael Linsin guides you through 11 little-known habits of the happiest, most effective teachers on Earth. Skills to benefit you the rest of your life! From two leading experts in education and entrepreneurship, an urgent call for the radical reimagining of American education so that we better equip students for the realities of the 21st-century economy. the most important book you may read in your life! In this groundbreaking book, education expert Tony Wagner provides a powerful rationale for developing an innovation-driven economy. He explores what parents, teachers, and employers must do to develop the capacities of young people to become innovators. How do other countries create "smarter" kids? In a handful of nations, virtually all children are learning to make complex arguments and solve problems they've never seen before. They are learning to think, in other words, and to thrive in the modern economy.What is it like to be a child in the world's new education superpowers? In a global quest to find answers for our own children, author and Time magazine journalist Amanda Ripley follows three Americans embed­ded in these countries for one year. The positive discipline method has proved to be an invaluable resource for teachers who want to foster creative problem-solving within their students, giving them the behavioral skills they need to understand and process what they learn. Each tool is tailored specifically for the modern teacher, with examples and solutions to each and every roadblock that stands in the way of cooperative and student-centered learning. From grade school to graduate school, from the poorest public institutions to the most affluent private ones, our educational system is failing students. In his provocative new book, cognitive scientist and best-selling author Roger Schank argues that class size, lack of parental involvement, and other commonly cited factors have nothing to do with why students are not learning. The culprit is a system of subject-based instruction and the solution is cognitive-based learning. This groundbreaking book defines what it would mean to teach thinking. The Wild Card is your step-by-step guide to experiencing a creative breakthrough in your classroom with your students. Authors Wade and Hope King show you how to draw on your authentic self - your past experiences, personality quirks, interests, hobbies, and strengths - to deliver your content creatively. If you are a high school teacher or a kindergarten teacher, the seven steps in The Wild Card will give you the knowledge and the confidence to bring creative teaching strategies into your classroom. Innovation expert Ted Dintersmith took an unprecedented trip across America, visiting all 50 states in a single school year. He originally set out to raise awareness about the urgent need to reimagine education to prepare students for a world marked by innovation, but America's teachers one-upped him. He met teachers in ordinary settings doing extraordinary things. Capturing bold ideas from teachers and classrooms across America, What School Could Be provides a realistic, and profoundly optimistic, roadmap for creating cultures of innovation and real learning in all our schools. Every Student. Every Day. Whatever It Takes. Average schools don't inspire greatness - and greatness is what our world needs if we are going to produce world-changing learners. In Culturize, author and education leader Jimmy Casas shares insights into what it takes to cultivate a community of learners who embody the innately human traits our world desperately needs, such as kindness, honesty, and compassion. His stories reveal how these "soft skills" can be honed while meeting and exceeding academic standards of 21st-century learning. MUST READ for every educator! Kids are naturally curious, but when it comes to school, it seems like their minds are turned off. Why is it that they can remember the smallest details from their favorite television programs, yet miss the most obvious questions on their history test? Cognitive scientist Dan Willingham has focused his acclaimed research on the biological and cognitive basis of learning and has a deep understanding of the daily challenges faced by classroom teachers. This book will help teachers improve their practice by explaining how they and their students think and learn - revealing the importance of story, emotion, memory, context, and routine in building knowledge and creating lasting learning experiences. "Learning styles" don't exist. The processes by which different children think and learn are more similar than different. Intelligence is malleable. Intelligence contributes to school performance and children do differ, but intelligence can be increased through sustained hard work. You cannot develop "thinking skills" in the absence of facts. We encourage students to think critically, not just memorize facts. However, thinking skills depend on factual knowledge for their operation. 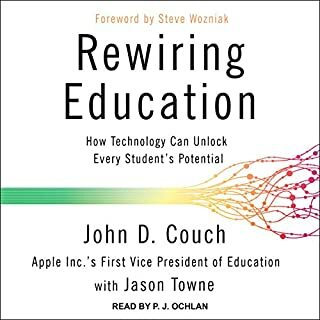 Why Don't Students Like School is a basic primer for every teacher who wants to know how their brains and their students' brains work and how that knowledge can help them hone their teaching skills. If you are a teacher seeking to engage students or a parent with a child in school, Why Don’t Students Like School? is a very helpful book. It is widely applicable to students in K-12 or in college. A cognitive scientist, Dan Willingham brings his discipline and its insights to this very needy area. He lays out the fact that before students can be taught to think critically, they must have mastered basic information. 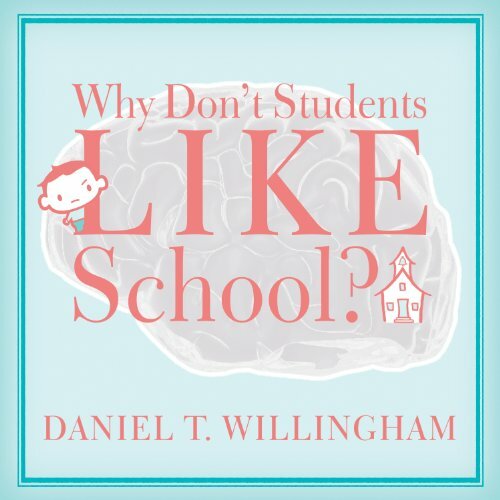 Essentially, Willingham posits that the more students commit details to long-term memory, the better able they will be prepared to use their short-term memory and frontal lobe to deal with more pressing problems. 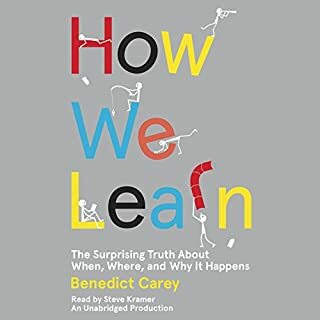 Along the way he debunks popular concepts such as the “learning styles” line of thinking (auditory, visual, kinesthetic…) which has little support in the empirical literature. 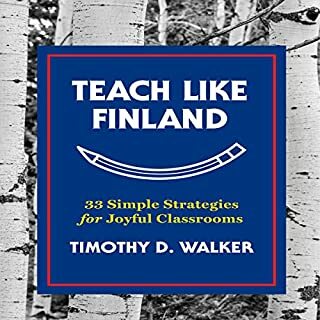 This is not an education bashing book, but the work of an individual genuinely interested in how we best teach students and engage them in thoughtful activity on a day-to-day basis. You may not like the book, but Willingham is persuasive. The reading of Paul Costanzo is excellent. I would buy for all my new teachers and parents who say "i just don't understand why he/she is like this". Lots of insight to how the brain works and why students do what they do. A good summary of the latest research and how to use it to help get better engagement in the classroom. Love this book, I refer to it often. What made the experience of listening to Why Don't Students Like School? the most enjoyable? Chock full of information I can use in my teaching/tutoring. What was one of the most memorable moments of Why Don't Students Like School?? Chapter 5 about the importance of practice. No, but it is one I love to return to for rereading. This is quite easily one of the most disappointing works in the social sciences or education that I have ever read or listened to. It has no redeemable qualities, the title is wholly inaccurate, the author under-qualified for some of the subjects he takes on, and the book bizarrely undershoots its audience. There is no reason to buy this book. The implication of the title is that this book is written from the perspective of cognitive science. It is not. This book has nothing to do with cognitive science. It is a summary of basic pedagogy. I can only guess that somewhere along the editing process someone noticed the title wasn’t testing well but fared better with the expanded “cognitive science” tag. It’s not inaccurate, the editors must claim, because the title doesn’t say the book entertains the perspectives of cognitive science. It says it is the perspective of a cognitive scientist who happens to talk about basic pedagogy and not consider it from the perspective of cognitive science. This is misleading and dishonest. I found some of the analysis so stunningly bad that I had to look up the author’s credentials and find out if he was a real Ph.D, or, as I suspected, maybe he ordered it in the mail or something. Turns out it is real. A quick click on a link takes me to his CV. At first glance, it looks impressive. There sure are a lot of titles here, but a few clicks reveal almost all of them are self-published blog style papers written for the AFT website rather than real research publications. The rest were published by American Educator, a publication that is pseudo-academic at best. Under submission guidelines you will-- I am not kidding-- find the phrase “We do not publish research papers”. They publish only essays, refuse all research, and claim to be peer reviewed. But it gets better. American Educator, it turns out, is operated by the same AFT website that published the authors blog papers. So in short, we have a “cognitive scientist” who seems incapable of publishing research in true peer reviewed journals, so instead he wrote a book. The author is a failed academic writing a sub-basic book in a field he is unqualified in with a completely misleading title. And I can’t even figure out who this hack-job attempt at research is aimed at. The book contains no citations, not even in-text references. For example, we are bombarded with generalizations like “One research experiment found that....” You can’t complete the sentence with the names of the authors of the research, or the university, or the year, decade, or century? It’s not like that is any harder to write. That makes the book less academic than an introductory education 101 textbook. Now I suppose the author and editor would say they want to improve readability. But at the expense of all credibility and usefulness to the reader? The audience here is primarily educators, who all have at least a college degree, and anyone picking up a book with the words “cognitive science” in the title is prepared to hear a reference or two dropped. Authors in the social sciences like Steven Pinker, Daniel Kahneman, and Charles Mann all managed to make the best sellers list writing to intelligent people and providing reasonable documentation which made the books more compelling not less so. In one particularly comical analysis the author takes on nature vs nurture and takes an anti-biology stance so naive that we are left to wonder if he even reviewed a high-school biology textbook before writing it. He “supports” the tabula rasa argument with straw man arguments of complete biological determinism so absurd no one could possibly believe them, and he even fails to understand that when evolutionary psychology uses the phrase “a gene for X” they mean the effect is probabilistic not literal causation. No one in the world believes you have a single physical gene for liking tomato soup, a gene for basketball skill, and a gene or enjoying purple more than blue. The author is in way over his head, is unread, unqualified, and has an insufficient understanding of probability theory to take on the subject. And this is one among many. They are all equally bad. Do not buy this book. Do not give this book to anyone you care about. Do not bother reading this book if it is given to you for free. Please, do not support the scamming of the public by financially rewarding pseudo-academic dribble. I finished the book excited at the possibilities to dramatically improve education for students. As a parent, I also have valuable tools to guide my own kids. Unless you are completely out of touch with your students or this is your first day in the classroom there is nothing here for you. In part of the book the author talks about using stories to keep kids attn. The story was so dull that he lost my attention! Don't waste your time or money. 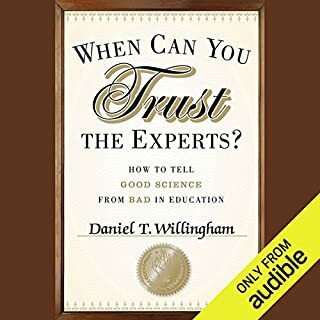 Would you ever listen to anything by Daniel T. Willingham again? This was painful to listen to. Not only is the narration dreadful, but much of the book relies on charts, drawings and illustrations, making it a poor candidate for an audio book, unless you can stop what you're doing and go look at the illustrations. Beyond that, the content is questionable and the title is misleading. I only made it 2 hours into the book (nearly 1/3 of the book) and there has been no discussion of why students don't like school. So far the things that have been discussed seem like the types of things taught in freshman level psych classes in college. This was a good book with helpful information, but many visuals accompanied the text. It's not possible to see those visuals while listening to the book, so this is one to read rather than listen to. Author proves his craft by presenting his content in a fascinating and easily digested manner. My oldest is starting kindergarten & this book has given me another framework for evaluation and ideas for how I can help. Of course ideas are applicable at work also. Great information, but the title is deceiving. The information here is very useful for teachers and can be put to great use, but the title doesnt really give you a good idea of what you are getting. A lot of learning theory books tell you these key principles, yet no book I've read so far has looked at it from this perspective. 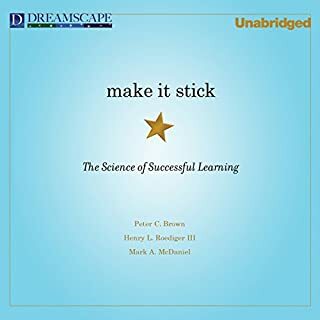 It is insightful, practical, drills down to core principles, and really makes you think deeper about the common learning trends which now people misuse so badly. Highly recommended to any teacher, parent, instructional designer, and learning specialist. Very interesting book with some great information. For me, what let it down was the narrating. I just found the guy's voice to be a bit too monotonous. I would recommend buying the physical book over this audiobook. The narration made this a difficult listen for me. A very robotic voice, good annunciation but completely lacking any character, emotion or tone change. I'd be very surprised if the author approved this choice of narrators considering the content of the book. Many early parts of the book talked about why people switch off and become uninterested in a subject.. and this is exactly what happens when you listen to a robot reading out text. in addition, there are some visuals which I didn't have to hand when listen to this (think they're provided for free via a web page but was listening on a device without internet access). Content sounds interesting but can’t locate online resources which would be quite an important part of the experience. The title of this book is deceiving. The book addresses why students don't like school by delving deeply into current cognitive science. While it does review the strategies that result in students' dislike of school, it also emphasises strategies that engage students and enable them to become confident, successful students. This book should be on all teachers' reading lists.